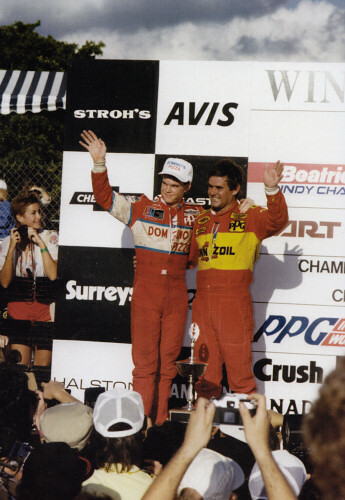 CART's 1985 season featured a memorable father versus son championship battle between Al Unser Sr. and Al Jr. Such a thing had never been seen before in any form of big-time auto racing and is unlikely to occur again. In the end, Bi Al prevailed by a single point as he chased his son across the finish line in the season-closer at Tamiami Park in Miami. Mario Andretti won CART's 1985 season-opener at Long Beach for the second year in a row and ran right at the front in the next three races, winning two of them. The race Andretti didn't win in that string was Indianapolis--yet again--where he led 107 laps but was beaten by Sullivan who passed him twice before taking the lead for good on lap 140. Sullivan's first attempt to pass Andretti resulted in his famous 'Spin and Win' incident as he spun in front of Andretti and miraculously kept his car from hitting the wall. 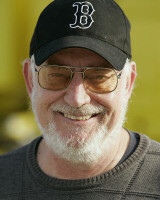 "When you get down that low and you're working the car hard, you're always in a dangerous position," Sullivan recalls. "When I came back across the painted yellow line and into the groove, the car got sideways and spun. I thought that was all she wrote but out of the corner of my eye I saw Mario below me and than I was suddenly pointed in the right direction. So I grabbed a lower gear and took off." Sullivan's spin brought a yellow flag so everyone pitted and a few laps after the restart Sullivan was able to successfully take the lead from Andretti by making the same move without spinning. Thereafter, Sullivan was in command, pulling away in his own and winning comfortably from Andretti, Roberto Guerrero and Al Unser. In his first season with Penske and a long rise through Formula Ford, F3, Atlantic and Can-Am, Danny had arrived at the top of the sport. "We had some problems early in the race," Sullivan recounts. "My car wasn't good in traffic and at one point we almost got a lap down to Mario but then the car started working and thanks to smart pit stop strategy by Derrick Walker we were able to get close to the front. We were running stronger and stronger all day and once I passed Mario we were able to pull away. The car was just fantastic at the end of the race. In fact, we ran our fastest lap on lap 199 and I remember feeling that if I had to run another hundred laps, I could do it. It was a great feeling." Andretti continued to lead the championship through Michigan in July. In fact, when the green flag waved for the Michigan 500 he was 20 points ahead of Al Sr. and Al Jr., only to have one of the biggest crashes of his career when a wheel came off. Andretti broke his hip, collarbone and four ribs, and for the first time in his career, he had to miss the next race. Mario was replaced for just one race by 1980 World Champion Alan Jones who finished fourth at Elkhart Lake. Andretti returned to action for 500 miles on the notoriously bumpy Pocono superspeedway. To add to his worries, Michael and teammate Kevin Cogan were lucky to escape injury when their helicopter crashed on the morning of the race while trying to leave for a short flight to the track. He made it home a painful sixth at Pocono and in the year's remaining races he was utterly luckless, finishing only at Phoenix in October where he was third behind championship duelists Al Unser Sr. and Jr. By season's end he tumbled to fifth in the championship behind the Unsers, Rahal and Sullivan. 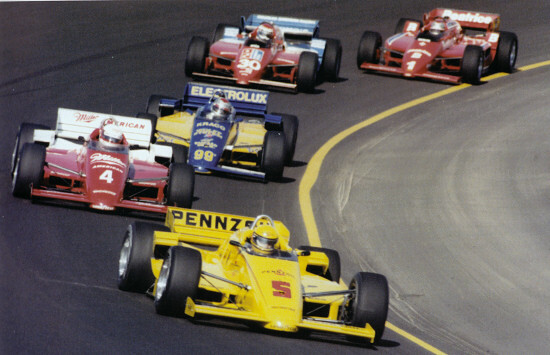 Mears made a brave comeback at Indianapolis in 1985. Rick's tender feet prevented him from doing any road or street races in '85, but he ran all the oval races and put in a superb performance to win the Pocono 500 in August. He also finished third at Milwaukee in June and was second at Michigan in September. But Mears sat-out the last three races of the year to allow the Penske team to focus on Al Sr.'s run for the championship. Sure enough, Unser finished a strong second to Rahal at Laguna Seca, then scored a superb win at Phoenix. He lapped the field at Phoenix while Al Jr. finished second, thus setting up a championship showdown between father and son at the season-closer in Miami. "I ran second that day and I felt like I won the race!" Al Jr. says about the family one-two. "That was the race of races." The season finale in Miami was won convincingly by Sullivan with Rahal finishing second as Al Sr. took the championship for the second time in three years by finishing fourth directly behind Al Jr. In a thrilling finish, father beat son to the championship by a single point to win Penske's seventh championship in nine years. "I think that has to be the biggest thrill I ever had," Al Sr. says. "Being in the winner's circle that year with Al at the Meadowlands and Cleveland and then finishing first and second at Phoenix and having the championship battle in Miami is something that always will be the highlight of my life." Al Sr. stole the championship from Al Jr.'s grasp by passing Robert Moreno for fourth place with only two laps to go. "When I got ahead of Moreno, I had made the point I needed," Al Sr. recalls. "As soon as I got around Moreno, I saw Al up ahead. There was nobody between us. I never even looked at the scoreboard. I had no idea where I finished, but it didn't matter because I had done what I needed to do, which was to finish just behind Al. "When I got the checkered flag and pulled up beside him, I had a very empty feeling because I knew I had taken something away from him that I shouldn't have done. At that moment, I really preferred that he had won the championship. But during the race, I was there to beat him. I had the crew and the whole team behind me, but I had to do it for myself. Al was not going to give it to me and I was not going to give it to him. It's the same way I treated my brother Bobby when we were racing together. But that was a whole lot easier to handle than racing for the championship with Al." Al Jr. had raced sprint cars for a few years before winning the Super Vee championship in 1981 when he was only nineteen. 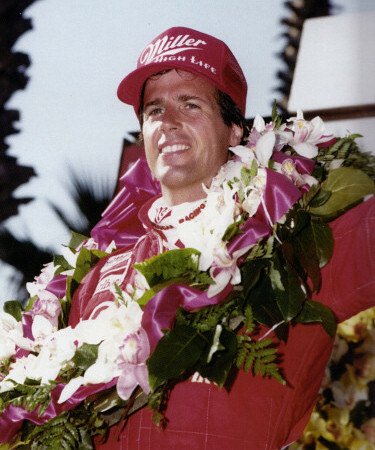 He went on to win the following year's Can-Am championship and made his Indy car debut in 1983 with Rick Galles's team. Al Jr. scored his first Indy car win with Galles at Portland in 1984 and moved to Doug Shierson's team in 1985. Aboard Shierson's Marches he won at the Meadowlands and Cleveland and took three seconds and three more third places. Despite breaking an ankle in a crash at Elkhart Lake in mid-summer he didn't miss a race, bouncing back to finish second in the Pocono 500 two weeks later. But Junior found the championship battle with his father at Miami was almost overwhelming. "That race upset me more than any other race," Al Jr. recalls. "The pressure and questions about who was going to win the championship really got to me. In the last laps of that race my stomach was so tight, all I could do was just try to stay within the walls. That was all I was trying to do. I had nothing more to give to the car, or the race, or the whole episode. I was in a hole and couldn't make any more points. "So when Dad passed Moreno, I knew it was all over. I just ran the last few laps and my stomach relaxed for the first time since I'd gotten off the plane in Miami. The pressure got to me but I learned more in that one day than my whole career to that point." Between 1977-'85 Penske won a total of seven championships with Tom Sneva, Mears and Al Sr. The team's record during that amazing stretch showed 39 races wins, including four Indy 500s. The team's chief engine builder Karl Kainhofer emphasizes the time and effort that went into producing reliable engines for Penske. "We used to build the motors, run them on the dyno, then pull them apart and rebuild them again before we raced them," Kainhofer reveals. "Later on, we had to stop doing that because we could not keep up with it. But that's what got us our success. For quite a few years there was so much new stuff coming along and I wanted to make sure it was reliable before we put it out there. "I was always looking for reliability more than horsepower but the horsepower came anyway because we increased rpm as we went along. We worked hard on the valve springs but with the rpm increase over time it got more and more difficult. Over the years we went from an 8,000 rpm motor to a 12,000 rpm motor. The rule makers took boost away from us, so we worked to make power by adding rpm." By this time Penske Racing had clearly established itself as Indy car's benchmark and America's most broadly-accomplished team.